Did you know that when you are waiting in line or stuck in between appointments, you could be winning prizes with your telephone? Text-to-win sweepstakes are a quick and easy way to win prizes in your extra time. Here are some tips on how to get started and which pitfalls to avoid. What Are Text Message Sweepstakes? Text message, also known as SMS or text-to-win sweepstakes, let you use your smartphone to enter sweepstakes on the go. They are convenient and can be a lot of fun as well. If you're at your grocery store and see an interesting giveaway that you'd like to enter, you don't have to wait until you get home and find the website on your computer or send out an entry by mail; all you have to do is whip out your cell phone, send a text, and you're entered. Sometimes you'll even find out seconds later if you're a winner. If you're standing in line at the bank or grocery store checkout, you can simply jump on your phone and use the time which would otherwise be wasted to win some prizes. How Do Text Message Sweepstakes Work? To enter text message sweepstakes, you'll need a type of telephone number called a shortcode and a keyword to text to that number. You can find this information in the sweepstakes' rules or in advertising materials for the giveaway. You then simply use your cell phone to send an SMS Message containing the keyword to the shortcode, just as you would any other telephone number. For example, the rules might tell you to text "the word 'SEC' to 567890." In this case, 567890 is the shortcode, and SEC is the keyword to enter. In general, you only need to compose a text message containing the keyword and use the shortcode as the recipient's phone number. It's that easy to be in the running to win. How Will You Know When You Win Sweepstakes by Text? Most of the time, you'll receive a text message letting you know that you've won and telling you how to claim your prize. Instant sweepstakes will notify you within minutes if you've been selected as a winner. Others will wait until the end of the sweepstakes entry period to notify their winners, so be sure to check your text messages regularly. Does Entering Text to Win Sweepstakes Cost Money? Depending on your cell phone plan, sending and receiving text messages might cost you money. 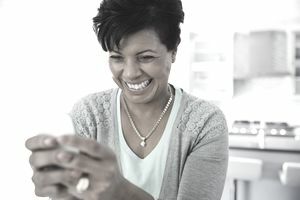 Before you enter any text message sweepstakes, be sure to find out whether your plan includes free SMS messages and how many you'll be able to send before you need to pay for them. If you have a per-text charge, you'll need to consider whether the cost is worth the chances of winning. In addition to the fees your cell phone plan charges for text messages, some sweepstakes charge "premium fees" to enter by SMS. These can be quite expensive. Be sure to read the rules carefully to find out whether you have to pay to enter by text. For more information, see Standard and Premium Text Message Charges. Are There Any Pitfalls with Text Message Sweepstakes? Many times, you can easily unsubscribe from these advertising texts by sending another keyword to a shortcode. Check the rules or the ads themselves for details about how to unsubscribe. A common sweepstakes scam involves sending victims a text message telling them that they have won a prize. To claim the prize, you need to click a link, which can install malware on your phone, con you out of releasing personal data, spam your friends, try to trick you into spending money to receive your "prize" and have other negative consequences. The FTC has tips on recognizing text scams. If you're having trouble finding the time to enter text message sweepstakes every day, Sweepstakes Ninja has a YouTube video showing you how to schedule your text entries in advance so you don't miss any chances to win. If you're a small or large business that would like to drive engagement through text messages, SMS sweepstakes could be a good choice for you. Sweepstakes administrator Marden Kane offers guidelines for running your own text sweepstakes.